Leather is one of the oldest materials humans have ever associated with. Ever since the first human looked at the carcass of a dead animal and said “that skin looks warm. Mine now.” we had used leather to dress ourselves, build our machines, even feed ourselves when times got tough. But leather, as you well know, is not invincible. Leather cracks, it fades, it ages, it is repurposed skin, but the skin will fall apart if not cared for properly. This is where today comes into play. 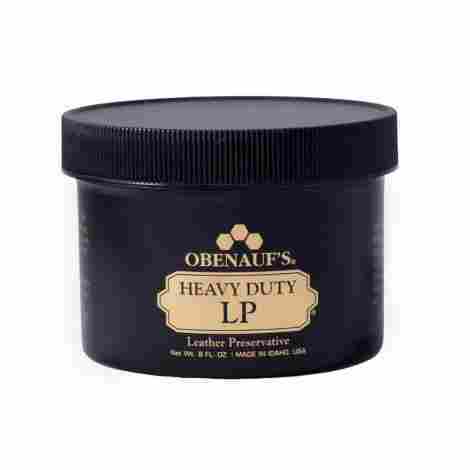 Kicking off our list, we have Obenauf’s Heavy Duty Leather Conditioner. 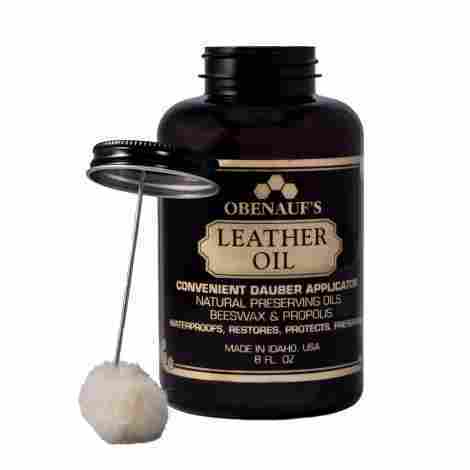 If you want quality leather care and conditioner, Obenauf is pretty much the biggest name to go after. They’re the only brand on this list to have two entries instead of one, and they’re the top 2 entries on this list. So, let’s see what made them that way, as we look at this first entry. All leather conditioner that’s worth anything restores dried up, sun faded leather, but few other brands, even on this list, go farther than that. This leather not only restores your leather’s physical condition, but it also repels and resists mold, mildew, scuffing, bacteria, and so forth. So future, more subtle damage, is avoided because of this. It’s one thing to repair damage, but the best repair job prevents that same damage from being done in the same way. Which is why applying this conditioner to your leather makes it far more resistant to things like water, acids, salt, petroleum, and other chemicals that erode leather. Meaning that the primary causes of erosion in leather besides sheer age are now removed from the equation. This conditioner is priced at a very average rate as far as leather conditioner goes. So if you want a really good leather conditioner for a decent price, look no further. Claims it smells like honey. It does not. Coming in second place is the second Obenauf product on this list (as well as the last), it’s the Obenauf Leather Oil Condition Restore. Like we said, when it comes to leather restoration and conditioning, few people do it as well as Obenauf, who have been making a craft out of it for decades. Here is how their latest entry measures up. When you’re trying to restore something to its natural state, you need to dig down deep and get to the root of the problem and fix it. And that’s precisely what this conditioner does, getting down into the roots and fibers of the leather and restoring the leather from its deepest parts to make sure that, when fixed, it’s as fixed as it can possibly be. If there’s one thing that people hate about leather oil, it’s the fact that they make such a stink after you apply them. Understandable, given that it’s oil and oil always smell to some capacity, but it’s still annoying. However, the smell coming off of this oil is so miniscule, that it frankly may as well be completely odorless. The best part about this product is its price, which is very affordable, especially when you consider all that it actually offers you in terms of services. 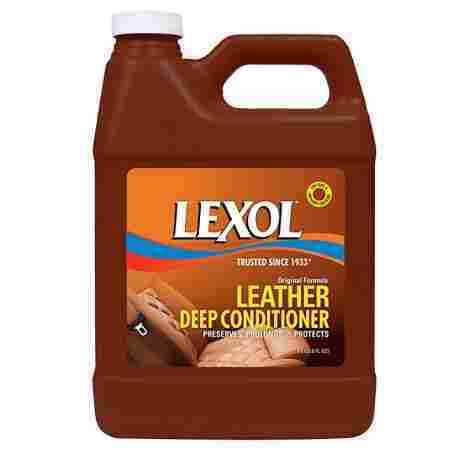 Finishing up our top three segment, we have something a bit different, with the Lexol Leather Deep Conditioner. This conditioner, unlike the ones we’ve seen thus far, is meant more for leather car seats and upholstery than for clothes. So how well does it do at this? Let’s find out. You can take care of the car itself as much as you want, but you still have to sit in the car seat, and it has a much shorter lifespan than the rest of the vehicle. Which makes it such a good thing that this oil doesn’t just restore the car, but also extends the seat’s lifespan in that restoration, keeping the usual problems from happening again, and thus keeping the seats in pristine condition for longer. As we said, you still have to sit in the thing when you’ve applied this oil. So, you’d better make sure that it doesn’t feel like the worst thing ever when you do. Which is why this oil is made in such a way so as to not leave behind any chemical solvents that, at best just feel gross to sit in, and at worst can be actively harmful. Unlike other entries on this list, this one comes in packs of 1-3 liters. Today we’re looking at the 1 liter container, and the price thereof is actually very fair, all things considered. 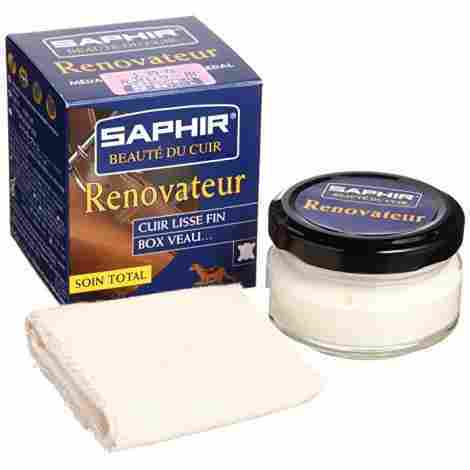 Coming in at #4, we have Saphir Renovateur Luxury Leather Care. As you can no doubt tell, this is a bit more professional quality than even the previous three entries. An imported good from France, this leather care balm is most commonly used by shoe polishers and the like. So, let’s take a look and see what makes this balm so popular. Not only is this a great conditioner for your leather clothes, but it’s also a handy bit of hydration. Leather needs to stay hydrated and retain some amount of water in order to stay fresh, and not only will this repair all damage done, but it will also rehydrate the shoe as well. Making this one of the most thorough rebuilding conditioners on the market. As long as it’s down there, it may as well give your shoes and jacket a good polishing while it’s at it. And that’s exactly what this pigment free leather hydrator does. First, it rebuilds the leather on a deep fiber level. Then, with just a quick bit of rubbing, polishes the leather it’s been rubbed onto to boot. The prices for these conditioners just keep going down, as we have an even cheaper price than the ones that came before. Which is doubly impressive, considering its status as an imported good. 5th on our list, we have the TriNova Leather Conditioner and Restorer. Unlike other entries on this list, the main thing about this entry is that it comes with its own application rag. A sponge-like object that you use to apply the conditioner to the leather. But what about the conditioner itself? Let’s find out. We’ve seen leather conditioner for bags, shoes, furniture, and leather seating in automobiles. However, rarely will you find conditioner guaranteed to work for all of them at once. At least, until TriNova tried their hand at making leather conditioner. Sure enough, this conditioner can be used with any and all leather surfaces, from car seats to shoes. There isn’t a single bit of leather that this conditioner can’t make look beautiful. When trying to restore old leather, it can be a pain finding just the right cloth to use it with. Most people choose old rags or t-shirts that they don’t use/wear anymore, but TriNova is a bit different. They want you to use the best possible applicator for their product, which is why they included their own applicator to get the job done right. While not quite as cheap as the previous entry, the price for this deluxe leather conditioner is still very fair and affordable. So, if you need some very good leather conditioner, and you’d rather not buy three different bottles for leather that’s really exactly the same when you get down to it, this is the one for you. 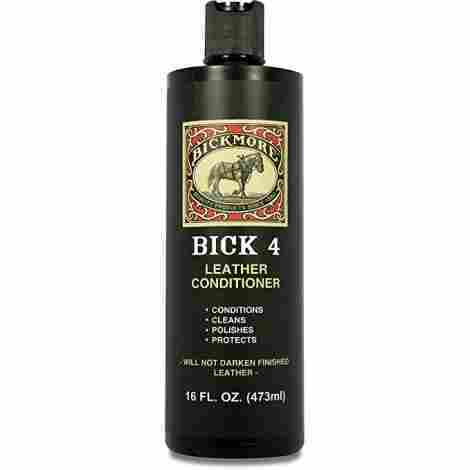 Coming in at #6, we have the Bickmore Bick 4 Leather Conditioner. Bickmore has been making leather conditioner for quite a while, almost as long as the first two entries on this list. And as such, they’ve gotten very good at what they do. But what makes the Bickmore’s Bick 4 so good? Let’s take a closer look and find out. The main drawback to using leather conditioner is that it tends to darken your leather, meaning that it discolors the leather in exchange for fixing the cracks and rehydrating it. This isn’t the biggest problem in the world, mind you, but with the rarest exception, it is the most common problem. This is where Bickmore differs. Its conditioner will do everything the other conditioners do just as well (even a bit better in some respects) and to boot, will have no discoloration effect on your leather. Another weakness shared by most conditioners is the presence of wax. Wax is great if you want to prioritize polishing, but it also tends to seal up the pores of the leather, making restoration harder on a deeper than surface level. Fortunately, this conditioner contains zero wax, meaning this is not a problem. This conditioner is wonderfully cheap, especially for a conditioner of its quality. It’s actually among the cheapest on this list, especially if you go for the smaller sizes. 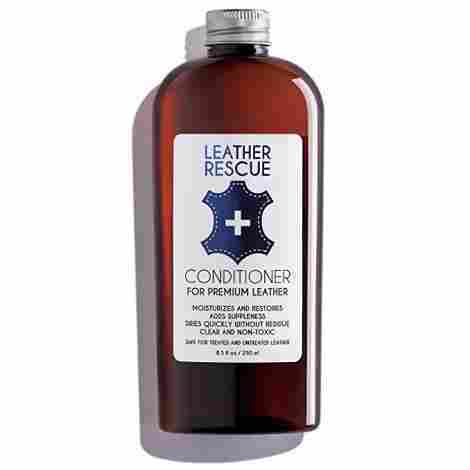 Next up, 7th on our list, we have the Leather Rescue Leather Conditioner. This conditioner is more focused on conditioning rather than polishing, so you should go after this one if you aren’t interested in tough, durable leather, and are instead looking for soft, supple, easy to wear leather. What does this conditioner have to its name specifically? Let’s find out. We’ve seen leather conditioners on this list so far that have taken several hours, even a few days, to dry off completely after being applied to your leather. Something that this leather conditioner seeks to change and succeeds. This conditioner will dry off after being applied to your leather in less than one hour. Making this easily one of the most convenient entries on the entire list. So, if you need to apply leather conditioner to get your leather looking presentable to get to some event, you don’t have to worry about your leather shoes looking all slimy when you get there. With other cleaning products, you want that aggressive cleaning. But not when it comes to taking care of your leather. That, you want to be nice and smooth. Which is precisely what you get out of this conditioner, which is a wonderfully gentle, pH-balanced, and non-toxic formula that will clean your leather in a gentle, smooth manner, and restore it to its original sheen. Kicking off our final three entries, we have the Leather Honey Leather Conditioner. Made over 50 years ago, with the same amount of time being spent perfecting the formula, this leather conditioner is meant to bring you the best in non-toxic leather conditioning that money can buy. A similar claim to almost every other conditioner out there, true, but let’s see how this one earns the title. Most leather conditioners can be expected to last a decently long time, depending on the kind of conditioner you actually buy. But few last as long as Leather Honey, which will protect your leather for as long as up to 6 months, depending on how thorough your treatment is. Make sure to get the whole thing, and you’ll have enough treatment to last you half the entire year. But it’s one thing to keep your leather boots looking good for 6 months or so, but it’s another entirely to think in the longer term. Which is why this leather conditioner not only helps your shoes or other leather clothing look better for the next 6 months but on a deeper level, they help to prolong the lifespan of all leather types, from seats to gloves to shoes and more. And the best part? No oily residue left behind. While a good deal pricier than the previous entries, it still isn't anything too bad. But by the standards set by this list, it is much pricier than it may be worth. 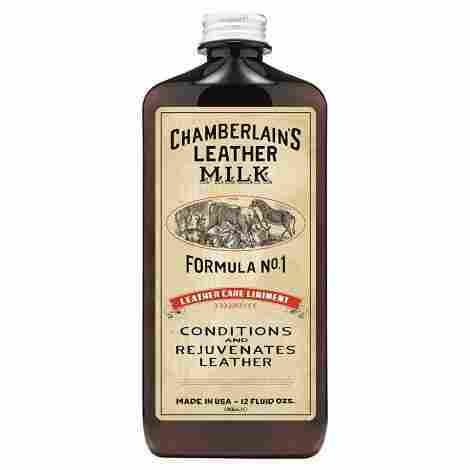 For our second to final entry, we have Chamberlain’s Leather Milk Leather Conditioner. Unlike other entries, where you apply it to a rag or applicator included with the leather conditioner, here, you apply it to a sponge-like applicator that comes with the conditioner and apply it like old fashioned shaving cream. So, what does this one have in store for us? Let’s find out. There comes the point where most people would tell you that it’s just over. There’s been too much time, too much wear and tear, and generally, the thing has gotten just too old to actually be functional anymore or have any hope of being repaired. Chamberlain's says thee nay in that respect, which is why this leather conditioner works on even the oldest leather you can find. It’s one thing to repair a scratch from a light brush with an object, but animal claws are another matter entirely. Animal scratches are deep, they’re brutal, and they’re meant to tear and rip apart, so there’s almost no such thing as a light scratch from an animal that has claws sharp enough to rip through solid leather. The good thing, however, is that this conditioner can turn around even the worst of animal scratches, making this one of the most versatile entries on the entire list. This entry is a midway point between the previous entry and the one before that. It isn’t cheap, but it isn’t too expensive either. So, if you have just a bit more money to throw around, then we highly recommend this leather conditioner. 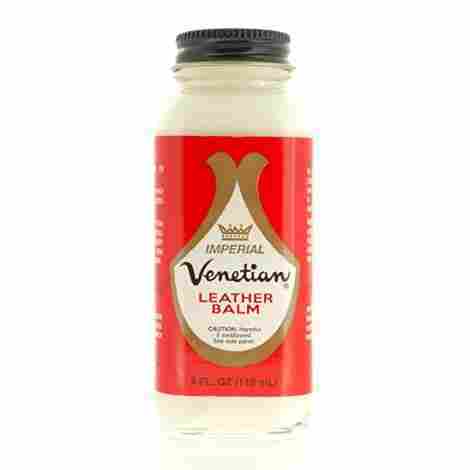 For the final entry of this list, we have Venetian Imperial’s Leather Balm. Unlike the other entries, and to its detriment, unfortunately, this leather balm is meant purely for leather boots and not much else. It’s not even great for other leather clothing like gloves or jackets. But with that said, let’s see what it actually does for boots. If you’re looking for good, focused boot polishing, then you have come to the right place. This leather balm is great for when you want to both enrich and protect the leather of your boots long after the other effects of this balm have worn off. After you apply the balm and give it a few seconds to really set it, do us a favor. Run over it with a horsehair brush or a microfiber cloth, and just see what happens. You may just be shocked to see a sheen develop over the shoe, the object taking on a glow to it, unmatched in the entire industry. The biggest problem with this balm is its price. Not that it’s too terribly high, but considering its limited scope of usability, we found the price to be bit un-earned. Leather conditioners aren’t really used by many people anymore, and that’s really a shame. They’re great cleaning equipment, especially if you’re a shoe polisher by trade. But more than that, if you have an affinity for real leather in general, then you should definitely consider getting some leather conditioner to be a top priority. If you know anything about leather, you know that it is, at least in part, made from the skin and hide of dead animals. And skin has a nasty habit of cracking, peeling, and generally aging if left untreated and preserved. Leather conditioner exists to do exactly that, getting deep into the inner layers of the leather, down to the deepest fibers, and fixing it from there. And with the really special conditioners, they can do plenty of other neat things as well, including prolonging the lifespan of the leather it’s applied to. And we can say with all certainty that every single entry on this list will suit your needs for a leather conditioner just fine. So, if you’re in ownership of pristine leather, and you’re noticing that it’s starting to lose some of its luster, and you’d like to reverse that, then pick out one of these excellent products and watch your leather be good as new. To put together a list of criteria for a list of the best leather conditioners, we had to dig in deep and form an intimate knowledge of what makes up the DNA of a good jar of leather conditioner. Which was certainly not the easiest feat, considering that not a lot of people use leather conditioner, leaving us to essentially learn from scratch. But despite that, we like to think we came up with a pretty good list. So, with that said, here are the most important criteria used for this list. When you’re looking for a leather conditioner, one of the things you typically have to look for first is the kind of leather you need the conditioner for in the first place. Are you looking for a conditioner for a leather seat? Leather gloves? Shoes? It may seem odd to some, but there really is a difference. Not every leather is made the same way, because one of the reasons that leather has lasted so long is because the material is very versatile. You can turn it into so many different things, that, of course, something meant to clean and restore it would have to itself be very versatile in order to meet the demands of different types. However, as we’ve seen on this list, there are ways to adjust the formula of your conditioner so that it affects different types of leather all at the same time. Which is something that we didn’t necessarily demand from our entries, but that we more than appreciated when it showed up. We’ve all probably heard the term pH balance tossed around at least once in our lives. Though probably without fully understanding what it means. It means a lot of different things depending on what the purpose of the formula in question is. In the case of leather conditioner, pH balance refers to how fast and how effectively the product is actually able to clean the shoe. The pH balance affects the amount of acidity and alkaline in the conditioner. Both of which are vital to the effectiveness of the product, but either one in abundance of the other, of course, is a big problem. So, take the time to learn how well balanced the pH is in your conditioner before you buy it. It may just be the difference between that perfect shine, and a ruined pair of shoes. But of course, none of that matters if you can’t even put the thing on your leather without any trouble. Ease of application refers both to the amount of effort you have to put in just to get the stuff on the leather to begin with. This can be affected by something as simple as just needing to find a dirty rag to put the conditioner on because the manufacturer didn’t feel like including an applicator with the package. Sometimes the manufacturer will be nice enough to find a way to dilute the whole show into a spray on the form. This is the easiest form of conditioner, but we left it off the list because quite simply, we couldn’t find any good enough for the list. In some cases, you put the material on the shoe, and that’s the end of it. You wait for it to dry, however long it takes (but that’s for another minute from now) and then it’s over. But there are some, that didn’t even make it on the list, that takes a bit more effort. After you apply the conditioner, then you have to wait until the conditioner has dried and soaked completely into the leather. Afterward, the rest of the caring process comes if there is a process afterward at all. But then, the waiting is the key here, isn’t it? Indeed, you would think we would have this down by now, but unfortunately, several manufacturers still have trouble making their conditioners take less than an entire day for your shoes to be usable again after applying what was, ironically, meant to make them more presentable when worn. At most, this can actually take a few days, three at most. At best it can take an hour or two before fully soaking into the leather and beginning its work. But then there’s another potential problem you might have to deal with. Of course, you don’t go slathering goo on your clothes and expect it all to be gone by tomorrow. You actually have to look out for gooey, slimy residue that might be left on your leather, even after the essence of the stuff has been soaked in and is safe to scrape off. The problem is that this is a hassle, with the goo being disgusting and usually sticking to and dripping off of everything you try to take it off with. So, we made sure to try and find as many entries as we could without any residue being left behind when you finish applying it. Which isn’t to say it’s completely unreasonable, just that it’s an inconvenience that you likely don’t feel like dealing with. Our final criteria for this list was the price of each entry. You won’t likely be paying more for these entries than you would for, say, a container of luxury shave butter. This is meant as a luxury item, so you are paying a little bit more for it, but it’s rarely anything unreasonable. So, judging each entry by the prices, they asked for was simple enough. We basically judged what each entry could do, and then compared it with what price it was asking for. None of the prices on this list are unreasonable in a vacuum. But if what’s being offered isn’t anything worth the price, then we judged it a bit harsher. For the final segment of this list, we’re taking a look at some frequently asked questions surrounding leather conditioners. Now, there weren’t many that we could actually find, but those that we did were vital information to know, so here we are. These are the most frequently asked questions surrounding leather conditioners. Q: How much leather conditioner do I actually need per application? A: This is actually going to depend on a ton of different factors. The amount of conditioner you need will depend on the amount of space you need to cover, the age of the object you’re covering, the present condition thereof, and of course, the type of leather you’re dealing with in the first place. This is where things get tricky, and we recommend you find three or four different types of conditioner to compare and contrast. Between that number, you’re bound to find one that suits your needs. Q: How often do I need to apply conditioner? A: This one actually depends on the conditioner itself, rather than what you’re using it on. The variables include the amount of time it takes for the conditioner to soak in completely, the longevity of the effects themselves and the quality of the conditioner. If the conditioner is prone to breaking down quickly but leaves long lasting effects in its wake, then you actually won’t have to reapply it for a while afterward, because it’s still being used. Ideally speaking, assuming you’ve found the perfect conditioner for your situation, then you should have no problem with it until maybe twice a year when you have to reapply it again. But beyond that, you should be fine. Q: How long does it actually take to apply leather conditioner? A: There is, fortunately, only one variable here, and it’s exactly the one you expect: the size of the object you’re dealing with. If you’re working with a pair of boots, for instance, it shouldn’t take you more than 3 minutes, give or take a minute or two. But with, say, a car seat, it may end up taking you ten minutes per seat. So definitely don’t do that unless you have no plans in the immediate future, because between applying it and waiting for it to dry, you’re going to be busy. Q: My leather boots are beginning to fade, can leather conditioner help with that? A: For this, you’re going to have to get specific about what you want from your leather conditioner, because not all leather conditioners do this. It all depends on whether or not it has the ingredients to pull it off. The idea that you’re looking for here is to track down a conditioner that both works really well and still maintains the leather afterward to keep it looking good. If you need a place to start with this, there are quite a few entries on the list above that help with fading, so you should be covered there.